The only way to celebrate one of the most memorable days in election history is with family, especially when you're Amy Schumer and Chuck Schumer taking election day selfies. For those unaware, the Trainwreck star and the New York State Senator are first cousins once removed, so why wouldn't they be hanging out on election night? Plus, Sen. Schumer is on the 2016 New York ballot for re-election to the Senate, so, yeah, Amy is showing him some support. As she wrote alongside her Instagram photo shared Tuesday night, "Still sick but showin up for the fam and madame president!" 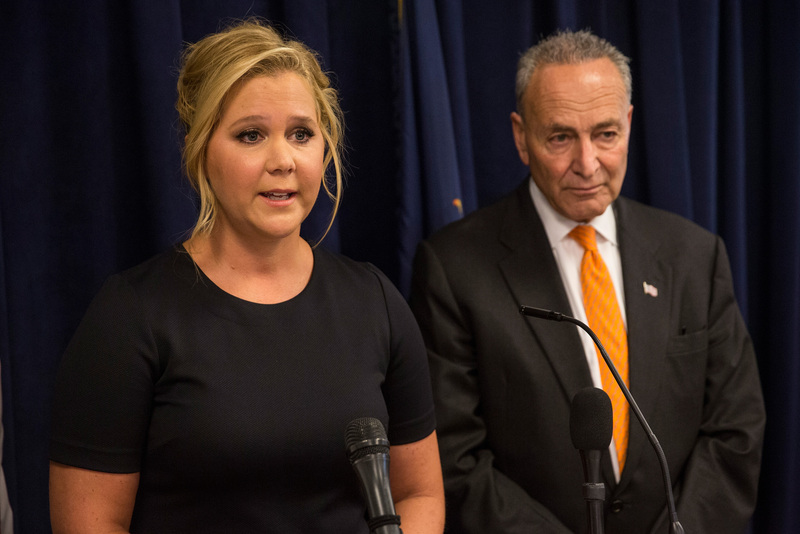 For those living under a rock, the Inside Amy Schumer star is not only supportive of her cousin, but also a die-hard advocate for Democratic nominee (and soon possible first woman president of the United States) Hillary Clinton. It's clearly an extremely special day for the comedian with both her relative and Clinton potentially scoring some major wins in the state of New York and nationwide, respectively. Both Schumers haven't been quiet during this particular election, especially when it comes to speaking out about the importance of gun control. In August, Amy and Chuck revealed a detailed initiative to combat gun control during a press conference in New York City. They even went to the White House together in January when President Obama signed his executive order on gun control. They've done some big things together, so why not add the 2016 election to that long list? When it comes to politics, these two family members know how to make their voices heard and how to celebrate appropriately.